For years in Amsterdam, Anne La Berge is a recognized free-improvisation composer and flute player, open at the same time to other genres and styles, thanks to her constant activism in different academies, collectives and musical institutions. In 1999, in the Dutch capital, she did some live performances, Kraakgeluiden, with Steve Heather and Cor Fuhler, where they explored the combinations of personal computers and acoustic and electronic instruments with the use of real time systems developed for the interactive shows. This experience lasted until 2006 and was probably crucial to enlarging her musical horizons and moving her to a new broader vision; not only instrumental but a new methodology which may include samples, synthesized sounds and the use of spoken texts, hyper-vivid in the meticulous electronic processing. 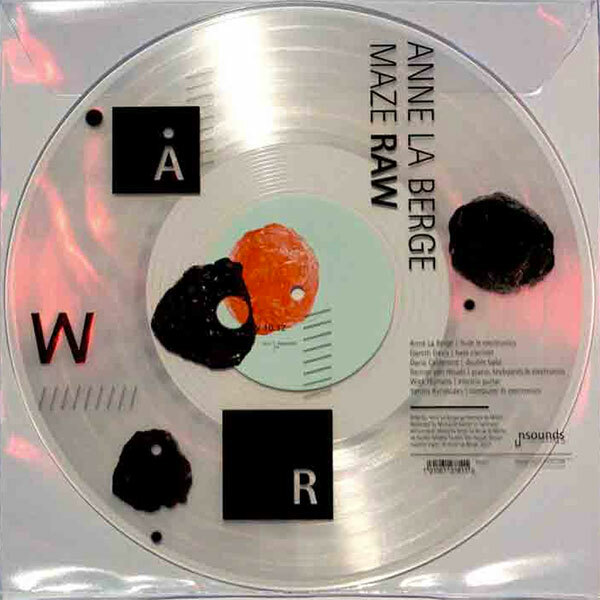 Since then, Anne La Berge has continued to work in this research field, putting in relation film sequences, narrative vocal samples and music, until the creation of a new project, an open work written for the ensemble MAZE, of whom La Berge is also a founder member. The work puts together fragmented gestures and bare dialogues and is based on a Max patch. La Berge projected the patch to generate random combinations and shared it with all the musicians involved, who could interact and continuously re-modulate the score thanks to the use of tablets as “animated” scores. Released by Unsounds in two parts, 20 and 10 minutes long, RAW is the result of different unexpected combinations, made in real time by the musicians through random choices in the software. The combinations of the ensemble, the music to play, the samples and the pre-recorded parts to overdub are all elements run by the software. As a result, despite the imprinting of good musicians, the work will be always be different. Dario Calderone on the double bass, Reinier van Houdt on the piano, Gareth Davis on the bass clarinet, Wiek Hijmans on the electric guitar and Yannis Kyriakides on the electronics are an assurance of quality and talent, moving in a land where the structure of the sounds and the focus on the articulations of the parts are definitely essential.